With the last Thanksgiving dish washed and the slow start back to work and school today, the holiday season has officially begun! This is my favorite time of the year. Lights twinkle on houses and trees, holiday parties begin, and there is so much festivity all around. Recently, I was looking back at some photos from my study abroad semester in college (which I can’t believe was five years ago!) and remembered that some of the best memories I made on my trip were during this time of year. The town I lived in in the Netherlands was only an hour from the German border, and only a few hours away by a direct bus to the German town of Bremen, which was known for it’s Christmas market. As one of our last excursions of the semester, my travel buddy, Hannah and I decided to take a day trip to the Bremen to explore the small, historic town and see the vast Christmas market. We wanted to make the most of our day, so we took the first bus out and had return tickets for one of the last busses of the day. At the time, we thought it was a great plan. It wasn’t until we got off the bus in Bremen and realized we would have to stay outside in the frigid northern Germany December weather all day that we regretted our decision. We popped into shops and coffee shops throughout the day, waiting for the market to open and trying to break up our time outside with some warmth. By the time nightfall came, we were freezing cold, but the beautiful market stands stretching on and on, and the lights hanging overhead in all of the streets made the cold wait worth it. As we walked around the stalls, Hannah had been to Christmas markets back home near Chicago and exclaimed that we needed to find some glühwein to warm up our cold hands and bodies. 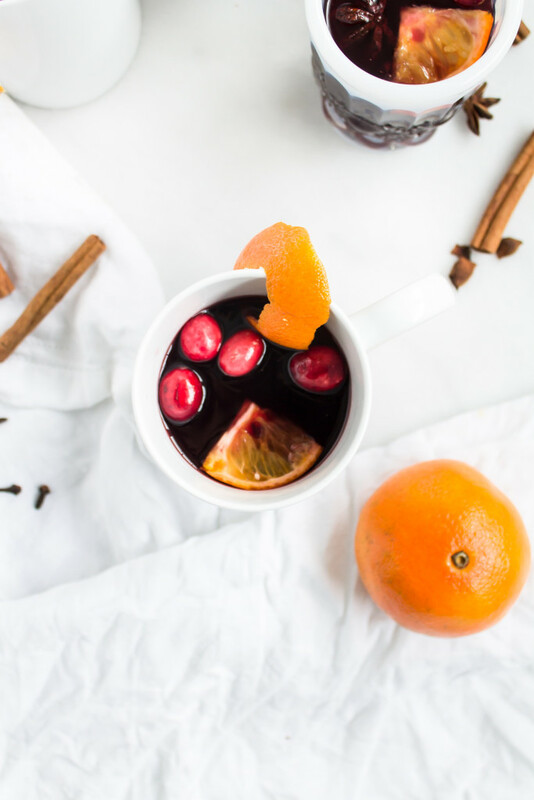 As a naïve young American southerner, I had never been to a Christmas market, and definitely didn’t know what glühwein was, but was intrigued and willing to try anything that would warm my fingers. 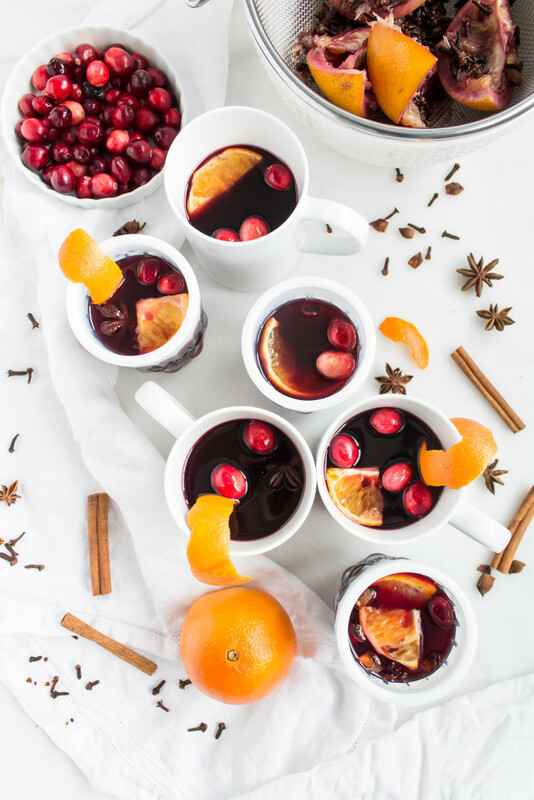 She explained that glühwein is a typical German version of mulled wine, or red wine heated with cinnamon sticks, anise, cloves, oranges, and sugar. 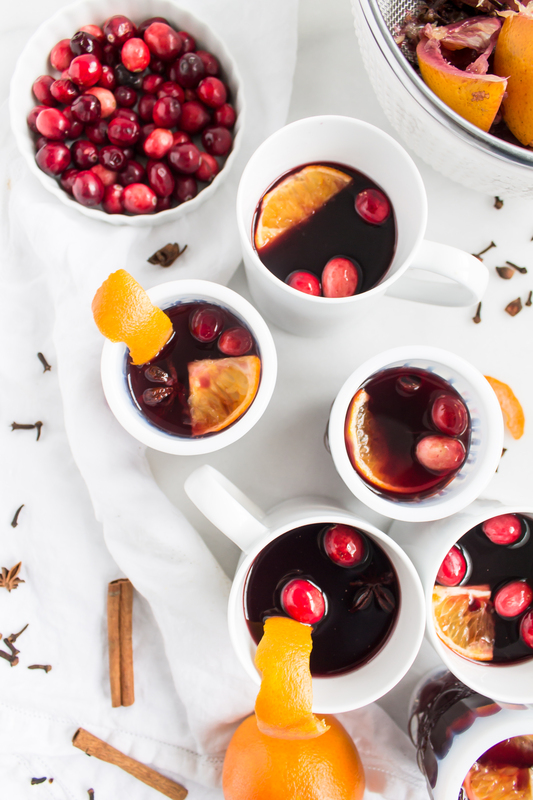 At the Christmas market, there were stands all over selling glühwein with signs saying “mit schuss,” meaning the mug of warm spiced wine was served with a shot of rum. We chose a stand that served the drink in clay souvenir mugs and watched as the vendor prepared a large basin of what we later found out was feuerzangenbowle, another form of glühwein where a rum soaked sugar loaf is set on fire and drips down from a metal grate balanced across the pot that contains the warm mulled wine. 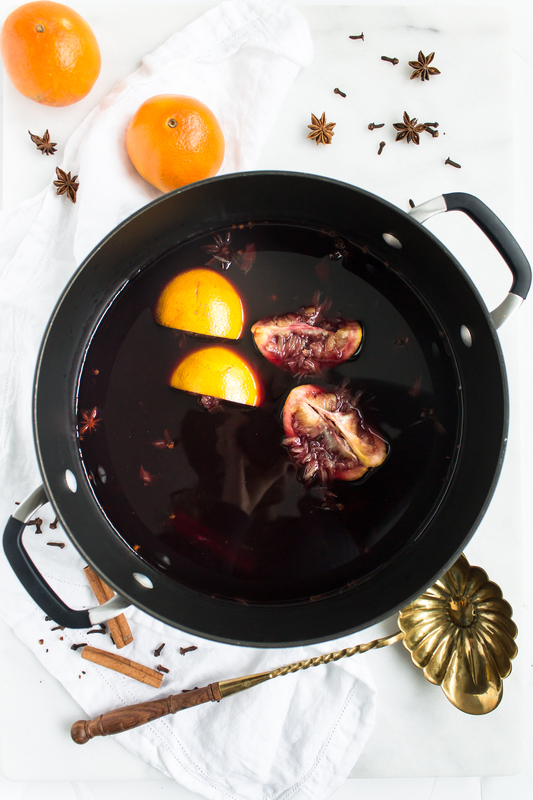 The rum and melted sugar drip down into the hot, spiced wine, and provide a show along with an amazing drink. With just one sip we were both in a better mood. 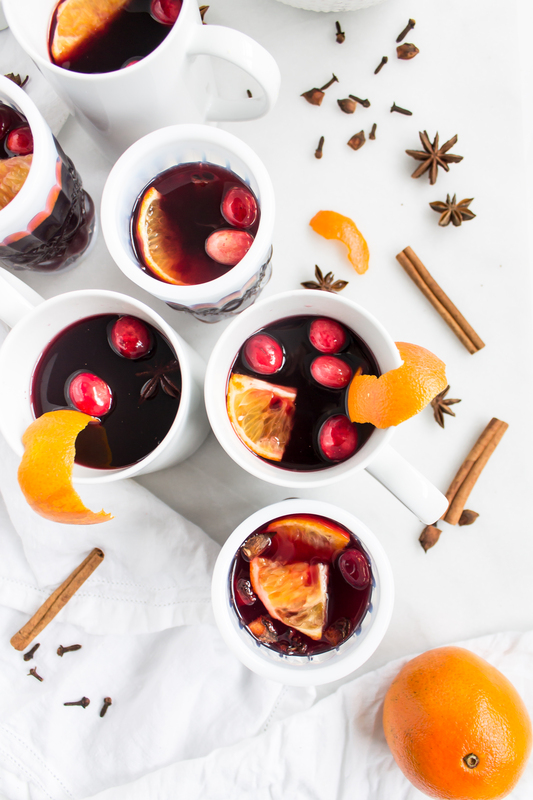 The wine was warm, sweet, and spiced – perfect to sip on under the Christmas lights after a long day in the cold. 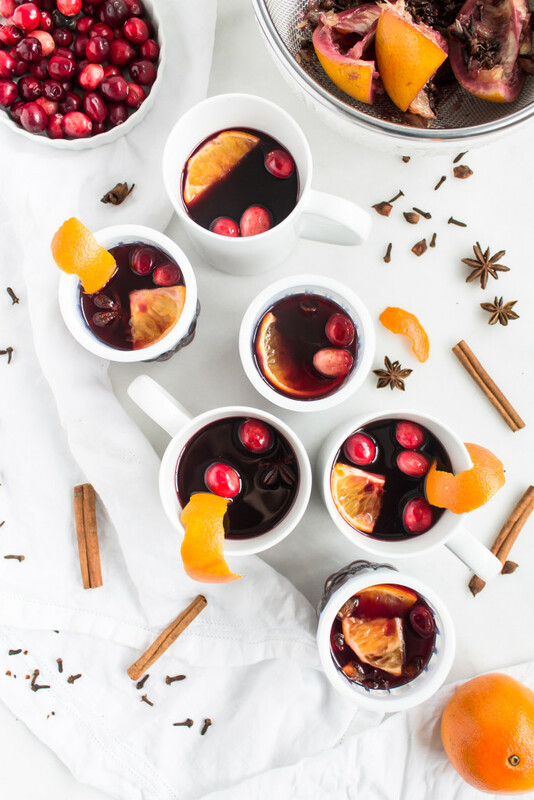 Ever since that trip I have wanted to recreate the delicious glühwein we had that cold, festive night. Tasting this homemade version brought me right back to that beautiful German Christmas market. Mulled wine is a wonderful drink to have throughout the season for gatherings with small groups of friends, or parties with lots of people gathered around. It is so simple (just throw everything in the pot and heat!) and is easily multiplied for whatever size crowd you expect. Heating the wine gets rid of some of the alcohol, so add a shot of rum to each glass if you want this to be more of a cocktail. Combine all ingredients together in a saucepan and heat over medium-low heat. Cook for 10 to 15 minutes, until hot, but not quite simmering. You don’t want to let it simmer, otherwise the alcohol will burn off. Serve immediately in glasses filled with cinnamon sticks and orange slices.